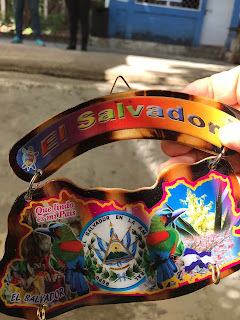 El Salvador, Part IV--Visiting a truly Holy Place. Our final day in El Salvador was one of the most moving experiences of my life. On the way to the airport and our journey back to the US we stopped in San Salvador at the shrine dedicated to Archbishop Oscar Romero who was martyred in 1980 because of his speaking out on behalf of the poor of his country. His simple apartment on the grounds of a hospital is no a shrine. Walking through there was a palpable sense of being in a holy place. In front of the altar flags of Unbound countries and pictures of Unbound founders. It was Sunday. We needed to celebrate the Eucharist. There were several churches nearby in Santa Ana, but we drove for 90 minutes over winding dirt roads and beautiful scenery. It was wonderful because it gave us a sense of the beauty of this wonderful country. There were several small farms and not a few sheep, goats cattle and other animals. At the end of our journey was the town of Los Apoyos where the Unbound community warmly greeted us. I must say that the greetings we received throughout this trip were truly humbling. The people so deeply appreciate what sponsorship is doing for them. After the Mass we were treated to a wonderful display of El Salvadoran culture, a display that showed us the richness of what sponsorship does. Sponsored children, elders and their families by developing their talents grow in confidence and with that with hope for the possibilities that await them in the future. On the way back to Santa Ana we visited the beautiful cathedral there and shared a great dinner at a local restaurant. After a busy and very moving first day I didn't know what to expect on Day 2 of this trip as we prepared to visit sponsored elders in the Santa Ana area. The day began with prayer which was lead by a beautiful 88 year old woman who was barely 4 feet tall. Her energy and enthusiasm inspired and energized us as did the stories of some of the other elders who attended. Being an elder myself (73 years old) I became filled with gratitude for what we have here in the US. 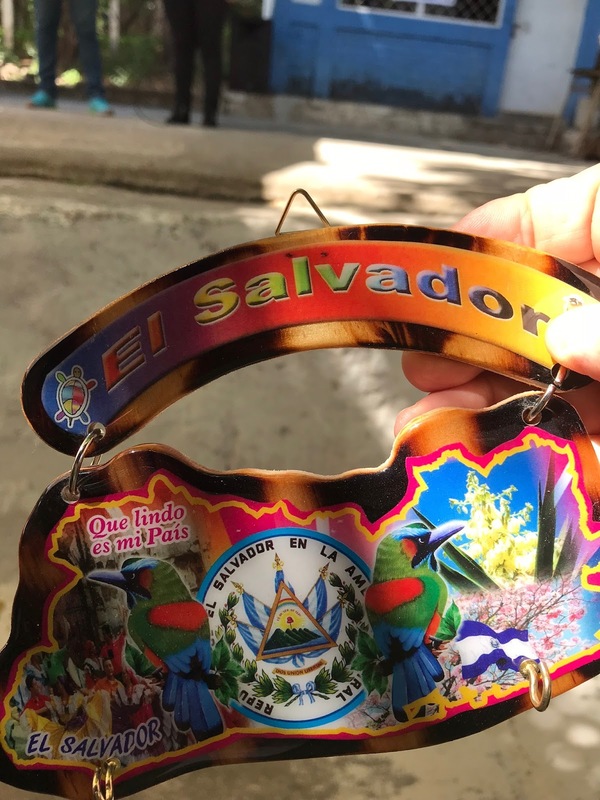 For one thing there is no social security or anything like it in El Salvador and in most of the other countries where Unbound is present, nor is there anything like Medicaid.a s a result the elderly, especially if there are no family members nearby to help, are in a difficult position. After breakfast we were split into two groups and visited gatherings of elders. As was the case with the sponsored children and parents community is a vital part of Unbound. Elders groups meet monthly to share experiences and encourage one another. They also receive benefits differently than the children as each month a different benefit is given. At this gathering new shoes for all, dresses for the women and pants and shirts for the men were given. At other time medical check-ups, medicines or a recreational experience may be the benefit. Some may think that recreation is rather superfluous as a benefit but most of these fine folks don't really get a chance to do simple things like going to a beach. As was the case with the mothers groups there was much singing and some serious prayer as well as a well-prepared hot breakfast. In the afternoon in three different groups we visited the homes of some of the elders. In my case a few of us visited a woman who lived in a very poor home and was so appreciative of being sponsored. She told us that sponsorship saved her life because it provided her with needed medicine. She did have a son and a neighbor who looked after her. In spite of the simple condition of her home with a dirt floor the home was filled with love and again with gratitude and hope. After two days of heading out for visits our next day kept us home at the Unbound center for a Christmas party for some of the Unbound communities in the Santa Ana area. Just last night I returned from a wonderful trip to El Salvador with Unbound. Many of you know that I have done quite a bit or preaching for this wonderful organization. Unbound really backs us priests who preach for them and desires that we experience the workings of their program first-hand, and what an experience it was. One blog entry cannot do justice to the experience that I had so there will be several of them in the days ahead. Though I have presented Unbound on this blog before I will again describe it for those who missed previous entries. The program sponsors children and elders in 18 countries around the world. At his point there are over 333,000 people being sponsored and the number is still growing. We preachers go to parishes and seek out people who are willing to sponsor. For more information you can go to Unbound. Perhaps after exploring that link you might be willing to sponsor. Before going to El Salvador I had visited Unbound headquarters in Kansas City and had the program explained to me. Having traveled to the Unbound center in Santa Ana, El Salvador the explanations came alive. The entries on this blog will tray to present various aspects of the work of this great organization as I experienced them each day. (Note: As a matter of policy Unbound does not allow pictures of sponsored members and families to be shared on social media so any pictures here will be of places, or be taken from behind the groups of people). On our first full day in Santa Ana we experienced Unbound sponsored children and the groups of mothers of these children who make it all happen. At morning prayer the mother of a five year old sponsored child spoke to us about what sponsorship meant. She talked about being able to buy shoes and clothing, etc, but most of all she shared deep gratitude and a sense of hope for the future of this boy and all of her children. There was not a dry eye among us. Later in the morning we split into two groups to visit two of the mother's groups. Community is a big part of the Unbound experience. As my group arrived at one gathering we were greeted like heroes with clapping and singing. It was a moving, emotional experience. Mothers meet together and support one another. They help each mother decide how the sponsorship funds will be used for her child. Unbound really believes that these mothers, and not some higher ups, know best what their child needs. In addition to gratitude and hope several mothers thanked us for trusting them. In the afternoon we were split up even more and visited the homes of sponsored children. In my case together with Fr. Tim Coday from Unbound headquarters, the visit was to the home of a girl and her family. The girl had just graduated from ninth grade and told us how it would not have been possible without Unbound. She told us as well that she not only wanted to complete high school, but to go on to a University. For a girl in El Salvador this is rarefied air. She had hopes of applying for an Unbound scholarship to help with her goal. (More on that in a later blog entry). Besides having her goals of achievement she, like just about every teenager that we met, sought to work in the future in some sort of service related job in their own country. I know that some who read this are asking "Where are the fathers?" Good question. Many of the fathers work long hours and cannot attend meetings, though some join in with the mothers groups. Others may have abandoned the family feeling shame about unemployment which is a big problem in El Salvador and elsewhere. Besides this it is only a few years since the end of a bloody civil was that took the lives of countless thousands of men. While there are many good fathers and husbands it is the mothers who are on the front line, and they do a great job.